The court granted plaintiff's motion to amend its answer to defendant's false marking claim to include laches and unclean hands defenses and rejected defendant's argument that equitable defenses may not be invoked against the government and therefore cannot be invoked against a defendant who stands in the government's shoes. "The Ninth Circuit considered an identical argument in the context of the Clean Air Act and disagreed. . . . Thus, the Court finds that laches and the equitable defense of unclean hands are suitable affirmative defenses against a citizen suit brought under § 292." However, the court denied plaintiff's motion to amend to assert an advice of counsel affirmative defense. "[T]he Federal Circuit [in Pequignot v. Solo Cup Co., 608 F.3d 1356 (Fed. Cir. 2010)] considered advice of counsel not as an affirmative defense, but as part of the 'intent to deceive' analysis. [Plaintiff] notes that the 'advice of counsel defense' contains the word 'defense.' But appending the word 'defense' to a phrase does not an affirmative defense make." In granting plaintiff's motion for summary judgment of infringement the court rejected defendant's argument that it did not infringe a method claim because the step of "supplying digital data representing each of a plurality of source data streams from a plurality of users" could only be performed by the end user and not defendant. "Defendants are unable to make a divided infringement argument because it is the software that performs all necessary steps of the patent. A user is necessarily involved at least at some point in most computer method patents; simple involvement, however, is not enough to give rise to divided infringement. For example, even the famous Amazon.com 1-click patent has a limitation requiring a 'response to only a single action being performed.' The user necessarily is the one who performs this 'single action' after going to the web page and searching for the item. If simple user involvement were enough to give rise to divided infringement, few, if any, software patents could be infringed." The magistrate judge recommended dismissing plaintiff's qui tam false marking action for failure to plead intent to deceive with particularity. "Plaintiff herein seeks to establish the element of intent to deceive by imputing knowledge of the expiration of the [patent-in-suit] on Defendants based on Defendants' alleged sophistication as a company, their experience and knowledge with patents and intellectual property and Defendants' alleged familiarity with the [patent] application specifically. . . . Plaintiff also alleges that Defendants paid the maintenance fees on the [patent-in-suit] until 2000 when such payments were discontinued. . . . [and that the products at issue] are marked with a 2009 copyright, indicating that Defendants 'contemplated, reviewed, authored, created, and approved the contents of the packaging/labels for the [products at issue], and purposefully chose to mark [the products] with the expired patents.'. . . Plaintiff has failed to adequately set forth the element of 'intent to deceive the public' required by 35 U.S.C. § 292." Defendant's motion to dismiss plaintiffs' qui tam false marking action for failing to plead with particularity was granted. "[Plaintiffs argue] in their brief in opposition to the motion to dismiss that the length of time that [the patent-in-suit] was expired is sufficient to show that [defendant] intended to deceive the public. We disagree. The length of [defendant's] alleged conduct alone does not show that [it] intended to deceive the public. [Plaintiffs] cannot rest on their single conclusory allegation regarding intent to deceive to satisfy the pleading requirements of Rule 9(b)." Plaintiff's motion to compel the production of defendant's settlement agreement in another case was denied. "Although [plaintiff] argues that the [patent] in the Texas case is 'directly relevant' to the . . . patents at issue in this case, I find that [plaintiff] has only shown that the [other] patent is one of a myriad of patents owned by [defendant] relating to prosthetic products that use a gel and substrate liner issued by Bruce G. Kania. . . . I note the strong federal policy supporting the confidentiality of settlement agreements, and the fact that information concerning [defendant's] knowledge of its liner patents and their validity is accessible by [plaintiff] via other discovery means." Summary Judgment of Noninfringement Granted as to Method Claims Involving Steps Performed Only Outside the U.S. Defendants' motion for summary judgment of noninfringement of plaintiff's wireless device management patent was granted in part as to method claims involving steps performed only by a server in Canada. "Plaintiff concedes that the Method Claims 'are not infringed to the extent that any step of any of these method claims occurs only outside the United States, e.g., at [defendants'] network operations center located outside the United States.' Plaintiff clarifies, however, that its infringement claims are not based on Defendants’ activities in Canada, but rather by Defendants’ alleged performance of 'each of the recited method steps within the United States.'. . . Accordingly, the Court grants Defendants’ . . . Motion and orders that [the asserted method claims] of the [patent-in-suit] are not infringed to the extent any step of these method claims occurs only at Defendants’ NOC located outside of the United States." The court granted defendant's motion for judgment as a matter of law of no willful infringement of plaintiff's aircraft data transmission patents as to four of the seven patents-at-issue despite the jury's verdict to the contrary. "[W]hile the infringement proceeding revealed that [defendant] acted despite an objectively high likelihood that its actions constituted infringement of a valid patent, there is no evidence to support a finding that [defendant] was subjectively aware of this objectively defined risk at the time the [four] patents were issued and added to the present litigation." In granting defendant's motion to stay pending reexamination, the court rejected plaintiff's argument that a stay would prejudice plaintiff's rights in that it would delay resolution of the litigation. "[T]his is an ex parte application by Defendant, which means that the Defendant is not permitted to have any further input. The deadlines are all in the control of the Plaintiffs. They are not required to take the maximum time to file the necessary documents or appeals. Any undue delay in the reexamination will not be caused by Defendants." Docket Report has been featured on Guide to Online School's list of the Top 50 Patent blogs. "We hand-picked a list of our favorite patent blogs and outlined the unique reasons why we think they're great. 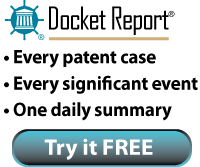 We chose the Docket Report blog because of your extensive coverage of patent litigation research. Your coverage of patent infringement litigation dockets provides readers with usable and easy-to-understand information concerning the current issues in this field." In denying defendants' motion for summary judgment on the issue of equitable estoppel, the court found that "[g]enuine issues of material fact exist as to whether [defendants] actually relied on [plaintiff's] action (or inaction), or whether they relied on a belief that the [patents-in-suit] were invalid." Plaintiff offered evidence of several letters drafted by defendants that questioned the validity of the patents. "Defendants characterize these statements as a mere 'initial reaction of [defendant's] business people . . . including their predictable questioning of patent validity and alleged infringement.' . . . Perhaps, but Defendants’ argument is effectively an invitation for the Court to resolve a genuine issue of material fact at the summary judgment stage. Doing so would be inappropriate and premature, particularly given the fact that all reasonable inferences tilt in [plaintiff's] favor." The court denied defendant's motion to dismiss plaintiff's qui tam false marking action and rejected defendant's argument that marking with the conditional phrase "[X products] are covered by one or more of the following U.S. patents: [#A, #B, #C, #D] and other patents pending," negated an inference of intent to deceive. "Defendant argues that the listing of an expired patent in conjunction with 'at least one nonexpired patent' does not support an inference of an intent to deceive. According to Defendant the conditional language used in its markings defeats any allegation of purposeful intent to deceive the public. Defendant’s argument lacks merit. That Defendant chose to couch its markings in conditional language does not negate the fact that some of the patents listed in the markings were expired. Further, Defendant’s use of conditional language could have the effect of deceiving members of the public into believing that the products were covered by all the patents listed in the markings." Defendants' renewed motion to stay pending ex parte reexamination was granted because plaintiff amended all of its independent claims during the reexamination proceeding and added new claims in response to the PTO's initial rejection. "[T]he PTO issued an Initial Office Action rejecting all of the [patent-in-suit's] claims in [defendant's] ex parte reexamination. In response, [plaintiff] did not attempt to distinguish the prior art over the original claims; instead, it amended all of the independent claims and added three new claims. . . . Given [plaintiff's] decision to amend its claims in response to the PTO’s Initial Office Action, the [patent-in-suit's] reexamination will result in amended claims with different scope and limitations than the claims currently at issue. . . . Thus, [plaintiff's] substantive claim amendments during reexamination strongly favor staying this litigation. . . Generally, the prejudice of staying [plaintiff's] claims against its direct competitors weighs heavily against a stay; however, [plaintiff's] decision to submit substantive claim amendments during the [patent-in-suit’s] reexamination neutralizes this prejudice. [Plaintiff] is not prejudiced by a stay of patent claims that it is attempting to change." Defendant's motion for attorneys' fees under 28 U.S.C. § 1927 following summary judgment was denied. "While plaintiff’s conduct at times may have seemed unreasonable, 'carelessly, negligently, or unreasonably multiplying the proceedings is not enough.' Throughout the course of this litigation both counsel have been warned by the Court that unprofessional and unreasonable conduct will not be tolerated." The court denied defendant's motion for attorneys' fees under 35 U.S.C. § 285. "Plaintiffs requested what appears to be excessive discovery, failed to compromise on minor litigation activities, unreasonably submitted two expert reports without prior designation in contravention of the Court’s scheduling order, and filed a motion for preliminary injunction two years after the product they sought to enjoin had been introduced to the market and then withdrew the motion only after [defendant] filed its response in opposition. As a result of this behavior, [defendant] was required to expend significant time and money on this action that could have been avoided or mitigated. Nevertheless, the Court cannot find by clear and convincing evidence that standing alone plaintiffs’ litigation tactics were exceptional." Defendant's motion for summary judgment of invalidity was granted because the only asserted claim included the term "optimization" which was insolubly ambiguous. "[B]ecause optimization necessarily involves tradeoffs, a database that is demonstrably inferior to the original data source with respect to the most important characteristics would still be superior with respect to some characteristic and therefore 'optimized.' A competitor would have no way to know whether a process for transforming a data source into a new database led to 'optimization' and would be subject to an infringement suit if the patent holder could locate a single characteristic of the database that is superior to that of the data source." The court granted defendants' motion for summary judgment of noninfringement because the asserted method claims of plaintiff's internet radio patent required the performance of steps by different actors who were not under common direction or control. "[E]very asserted independent method claim requires that some steps of the method are performed at the server arrangement, while other steps must be performed at the user’s computer. Here, the 'server arrangements' are provided by Defendants, while the accused 'user computing arrangement' - the personal computers used by end-users . . . are not provided by any of the Defendants. . . . [B]ecause the claims require multiple actors to meet the limitations of the accused claims and because there is no dispute that the parties involved do not control or direct each others’ actions or their computers, Defendants are entitled to summary judgment of no infringement on this basis as well." Defendants' motion to transfer venue was granted where the private and public factors favored transfer. "[Plaintiff] allegedly moved its office to a residential apartment complex in Frisco less than three weeks before this suit was filed. Although [plaintiff] has a long term presence in Texas, its presence in this district 'appears to be recent, ephemeral, and an artifact of litigation.'. . . [One defendant's] headquarters are located in the Northern District of California, and nearly all of [its] relevant documents and employees with knowledge of the accused products can be found in that district. Likewise, the vast majority of [the other defendant's] witnesses and evidence are located in Oregon, which is much closer to the Northern District of California than the Eastern District of Texas. Although [plaintiff] contends that all of its documents are located in this district, the Federal Circuit has indicated that the majority of physical evidence is provided by the accused infringers." Is Pleading Intent to Deceive upon "Information and Belief" Sufficient to State a Claim for False Marking? Yes -- Defendant's motion to dismiss plaintiff's qui tam false marking action for failure to state a claim was denied. "[Defendant] challenges the adequacy of the complaint, in part, based on its recurrent use of 'upon information and belief.' Relator’s allegations do not fail on account of their use of these qualifiers. . . . [N]othing in either [Bell Atl. Corp. v. Twombly [550 U.S. 544, 555 (2007)] or [Ashcroft v. Iqbal, 129 S.Ct. 1937, 1949 (2009)] suggests that pleading based upon 'information and belief' is necessarily deficient. The Court therefore concludes that pleading in this manner is not categorically improper, especially when information lies uniquely within the control of the defendant." No -- Defendants' motion to dismiss plaintiff's amended qui tam false marking claim for failure to state a claim was granted. "Plaintiff has lengthened its conclusory statements, but still fails to allege any facts or information that support its 'beliefs.' For example, Plaintiff alleges on 'information and belief' that Defendants 'engaged in a strategy of marking patents on their products for the purpose of deceiving the public' and 'purposefully allowed their products to bear the irrelevant patents.' These statements do not give any basis for Plaintiff’s belief that Defendants were employing a strategy or purposefully allowing irrelevant patents. . . . Plaintiff’s statement of facts alleges details which explain why it believes Defendants’ products are mismarked, but contains no information supporting the belief that Defendants were acting with an intent to deceive. Further factual detail is needed to survive a motion to dismiss under Rule 9(b)." Plaintiff's motion for summary judgment to preclude defendant from challenging the validity of two patents-in-suit based on prior art asserted in a related case was granted as to obviousness but not anticipation. "'While it is commonly understood that prior art references that anticipate a claim will usually render that claim obvious, it is not necessarily true that a verdict of nonobviousness forecloses anticipation. The tests for anticipation and obviousness are different.'. . . The [jury in the earlier case] was not asked to render a verdict with respect to [defendant's] anticipation defense; nor was this Court asked to reach such a judgment. Therefore, [defendant's] anticipation defenses were not 'actually litigated' and issue preclusion does not apply." Defendant's motion for summary judgment of invalidity due to prior invention was granted. "[T]he Federal Circuit has recognized that a prior inventor need not always have appreciated every feature recited in a patent claim in order to have conceived of or reduced to practice the claimed invention. . . . In view of the fact that the earlier-made CRESTOR® product formulations have been shown to meet all limitations of the asserted [patent] claims (by virtue of [defendant's] limited concession of infringement), [plaintiff's] discovery that crospovidone contributes to the stability of the formulations resembles the sort of scientific explanation for a prior art composition’s functioning that the Federal Circuit has found to be an inherent property of the prior art in other cases. The discovery of this inherent property does not make the pharmaceutical compositions claimed by [plaintiff] -- which [defendant] undisputedly made first -- new." The court denied plaintiff's renewed motion for judgment on the pleadings as to defendants' defense of failure to mitigate. "Plaintiff argues that failure to mitigate damages is not a defense in a patent infringement case because it cannot find any case law discussing this defense in the context of patent infringement and certain treatises on patent law do not discuss it. Plaintiff also argues that this 'makes sense because . . . a patent holder has no recourse when faced with an infringer but to seek a license and, if one is declined to sue for infringement.' The Court finds these arguments are without merit. . . . Here, Plaintiff is the injured party seeking compensatory damages for the alleged patent infringement. In determining compensatory damages for patent infringement under 35 U.S.C. § 284, the focus is on compensating the patentee or the plaintiff for this injury. . . . Thus, it is entirely appropriate for a defendant to assert a defense of failure to mitigate damages when considering what amount of compensation is appropriate for Plaintiff, the injured party in this action. Such a defense may rarely be relevant in a patent infringement case, but it is not inappropriate." IMX, Inc. v. E-Loan, Inc. et al., 1-09-cv-20965 (FLSD November 1, 2010, Order) (Martinez, J.). Plaintiff's motion to dismiss plaintiff's inequitable conduct counterclaim was granted and defendant was ordered to file a counterclaim that complied with the pleading requirements of FRCP 9(b). "[Defendant], inter alia, has not sufficiently identified the individuals involved or the information withheld and why it was material, nor has it alleged sufficient facts to support [plaintiff's] deceptive intent." Teva Women's Health, Inc. v. Lupin, Ltd. et al., 2-10-cv-00080 (NJD October 27, 2010, Order) (Hochberg, J.). Defendant's motion to dismiss plaintiff's claim of inequitable conduct for failing to plead with particularity was granted. "[Plaintiff's] pleading fails to 'identify which claims, and which limitations in those claims, the withheld references are relevant to.' [Plaintiff's] pleading also does not 'identify the particular claim limitations, or combination of claim limitations, that are supposedly absent from the information of the record,' which are 'necessary to explain both "why" the withheld information is material and not cumulative, and "how" an examiner would have used this information in assessing the patentability of the claims.'" TiVo Inc. v. Verizon Communications, Inc., 2-09-cv-00257 (TXED October 28, 2010, Order) (Folsom, J. ).